LOWELL, Mass. 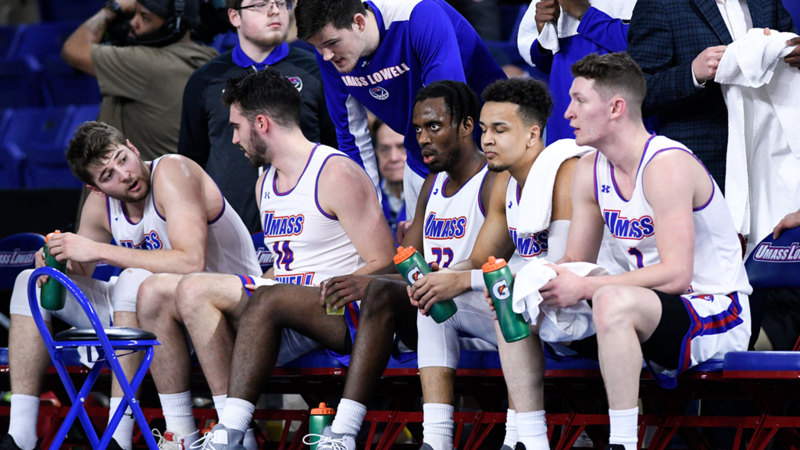 – The UMass Lowell men’s basketball team, who is 13-12 overall and 5-5 in America East play, will travel to UAlbany for a weeknight matchup on Wednesday. A win would give the River Hawks their first sweep of a season series against the Great Danes. A win would also match the team’s total America East wins from a season ago, as well as give UMass Lowell its most road wins since 2015-16 (5). Despite 16 lead changes, UMass Lowell faced a 76-65 setback at Stony Brook on Feb. 9. Redshirt-junior Christian Lutete turned in his ninth double-double of the season and second consecutive with 19 points and a season-high tying 14 rebounds. Sophomore Obadiah Noel joined Lutete as the team’s only other scorer in double figures with 15 points. Freshman Joey Glynn chipped in with eight points, as well. The River Hawks were up by one with 13 minutes to go in the contest, but the Seawolves used at 17-6 run to take the lead for good. Through 25 games in 2018-19, Christian Lutete is leading the team with 18.8 points and 8.2 rebounds per game. Sophomore Obadiah Noel, who follows closely with 15.3 points per game, paces the team with a 75.4 clip from the line and 30 steals. Josh Gantz boasts a team-best 23 blocks and has also dished out a team-high 72 assists. The Great Danes own an 8-16 overall record and a 3-6 mark in conference action. The team dropped a 69-47 decision at Vermont in its only game last week on Feb. 9. Ahmad Clark is currently first on the team with 17.0 points per game, 99 assists and 48 steals. Adam Lulka, who adds 9.0 points per game, leads the squad with 7.0 rebounds and seven blocks. As a team, UAlbany is shooting 40.6 percent from the field, including 34.8 percent on threes, and 73.9 percent from the line. With the decision against New Hampshire on Feb. 6, the River Hawks tallied their 13th win of the season, setting a new Division I program record. With 17 points and 11 rebounds, Christian Lutete became the first River Hawk to tally a double-double in their debut at the Division I level. He has added eight more since to rank first in the league and 36th in the nation with nine double-doubles in 2018-19. The River Hawks have come from behind to win five times this season after trailing inside of the final eight minutes in the second half. In three games, UMass Lowell has even overcome a double-digit, second-half deficit, most recently erasing a 14-point, second-half difference at Binghamton on Jan. 23. The River Hawks have boasted 35 points off the bench in their last two consecutive games. In 24 games this year, the River Hawks have averaged 20.9 points off the bench. This is up from last season when the squad averaged just 15.3 bench points per game. The River Hawks are 8-2 in 2018-19 when getting to work early and taking a lead into halftime. After an impressive 2017-18 season that landed Obadiah Noel on the America East All-Rookie Team, he has improved from 6.5 points per game last season to 15.3 points per game in 2018-19. That +8.8 improvement ranks among the most improved players in the nation. The River Hawks set a new Division I program record with 29 assists against Maine Fort Kent on Dec. 7. The squad is currently 28th in the nation with 395 total assists and is first in the America East with 15.8 assists per game. Ryan Jones became just the second player in the program’s Division I history to register 10 assists in a game in the NJIT contest on Dec. 1.